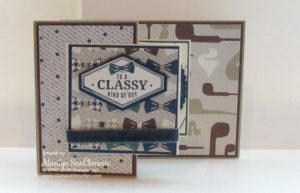 Today I am sharing a Handemade Masculine card made with the Truly Tailored Stamp set by Stampin ‘Up!. This is one of the cards that I used for a swap at the Hartford OnStage event. Did I mention how much fun my team and I had at the Hartford OnStage event? I do really like the Truly Tailored stamp set and the coordinating True Gentlemen Designer paper! 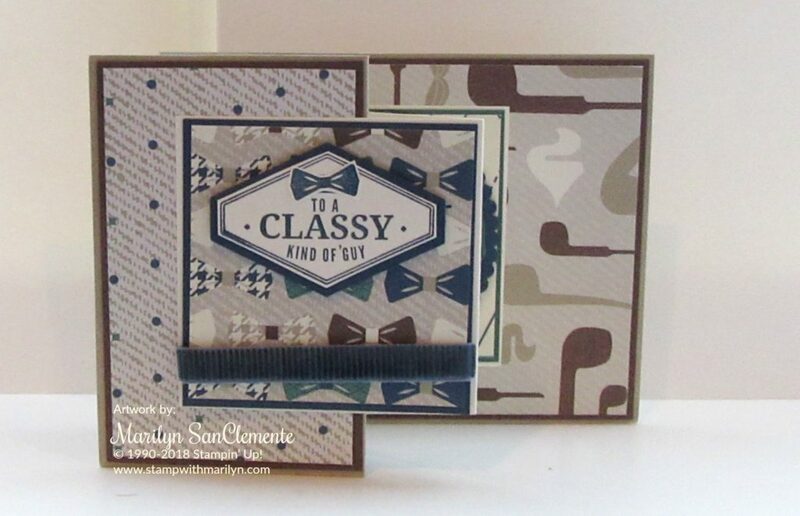 One of the better masculine sets that Stampin’ Up! has released in a while! I also like the Z Fold format which I seem to use for masculine cards each year. Lol, I am too predictable! 1. the Card base is a 11″ x 4 1/4″ piece of Crumb Cake cardstock scored at 5 1/2″ and 2 3/4″. Fold into a Z format. Front piece – cut a piece of night of navy cardstock to 2 7/8″ square, cut the designer paper to 2 3/4″ square. Back piece – cut a piece of tranquil tide cardstock to 2 7/8″ square and cut the designer paper to 2 3/ 4″ square. NOTE – I left the center vanilla square blank. You could add another layer to this pieces as well. 4. Add a piece of the Corduroy Night of Navy ribbon around the first layer before you attach the layers to the vanilla Z fold card. 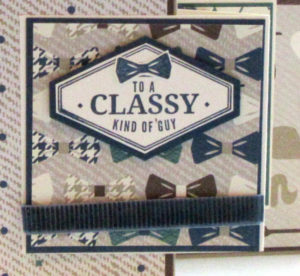 Stamp the sentiment “to a Classy Kind of Man” with Night of Navy ink on a scrap of very vanilla cardstock. Also stamp the little bow tie with Night of Navy ink. Punch out the sentiment with the Tailored Tag punch. Trim around the edge and cut out a tag with the punch from Night of Navy cardstock. Adhere the sentiment to the Navy tag. Cut out the bow with your snips and attach on the sentiment over the comb. 5. Now for the back panel. Use the Chocolate chip, Night of Navy and Tranquil Tide markers to ink up the sentiment stamp “wishing you a Dapper Day”. I used night of navy ink to ink the “wishing you a” and the Tranquil Tide marker to ink up the “Dapper Day”. I used the chocolate chip to ink the mustache. Stamp onto a piece of very vanilla cardstock. Cut this out with the stitched circle framelit that fits around this sentiment. Attach the circle to a scalloped circle cut from the Layering Circle framelits. Attach to the back side of the 3×3 piece. 6. Line up the front Z fold panel with the center of the front panel of the card. Make sure to add adhesive to only the left side of the panel as you want half the piece to hang over the closed edge. 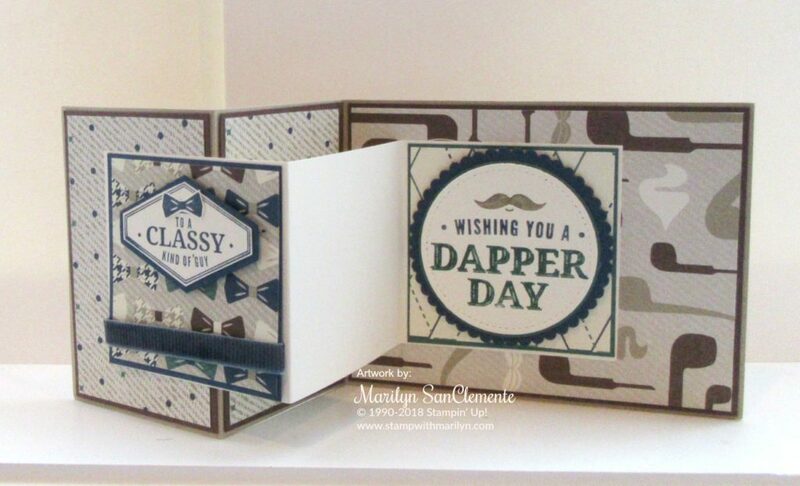 I hope that you have liked my Handmade Z Fold Card made with the True Gentlemen Designer Paper and the Truly Tailored stamp set. This stamp set and Designer paper are retiring. So if you would like to make this project and you do not have a demonstrator in the USA – I would love to be your demonstrator. If you order is under $150 then use the Host code AUZPM4HA and I will send you a gift for placing your order with me. I love to share the Host benefits with my customers! The Clearance Rack has been Refreshed!